Since everyone is posting about New Year and all, I also want to do the same. Just a short and simple post on what I did on New Year. We went to Ikea and IPC, and while the three boys were walking happily in front, Princess Ribbon the "maid" tagged followed behind to push the stroller, carry their bags, water bottles and of course, to snap pictures, haha. 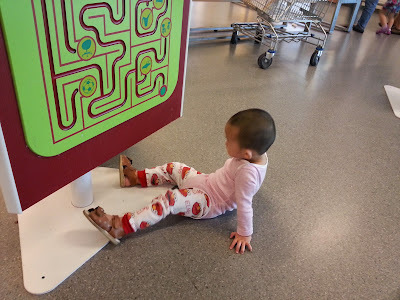 G made a scene before we left Ikea, showed tantrums and all. He won in the end! See the new soft toy? He got hold of this "sausage dog" at the Ikea check out area - RM23.90. Happy New Year, many more good things to come, and ok bye! Eh, but hor, he needs to hold his bolster everyday leh, even at the daycare.. No, it's not bantal busuk, I make sure I wash it everyday.. 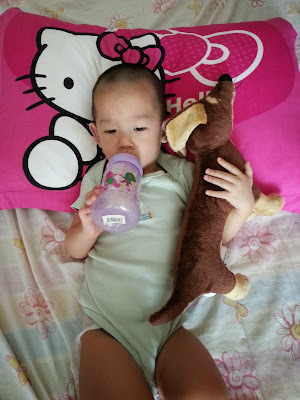 But he just needs to hold the bolster wherever he goes leh..
Haha. Nice sausage dog. I always want a real one though. Thought it is cute. The sausage dog looks very funny, skinny, with a long body and the nose looks like a rat, haha.. But it's cute la.. hehe..
New toilet ma, first few days maybe hug to sleep.. After that, maybe he will throw aside liao, haha..
Love your first pic! Beautiful show of parenting bonding and love. 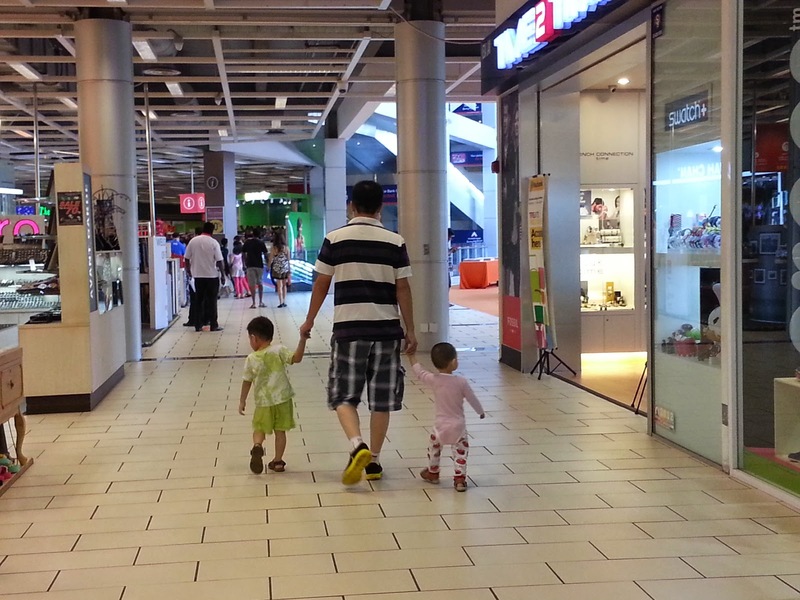 aiyo...baby G throw tantrums at mall? hmmnnn...time for zZZzzz? i m not sure but i would be very happy to stay in the mall when i was a kid! when time to go home, i pull a sad face. Reading your post makes me think of my mum now. She used to be like you when I was a kid where there are 2 boys in my family too. Now mummy is so frail and fading while our roles have been reversed. Hope you will enjoy and treasure all the happy moments. Good that you have photos to keep all details. Your sons would love your blog when they have grown up. Hope our internet will still keep our blogs. Happy New Year again Princess. G memang kaki manja and merajuk a lot.. haizzz.. Happy New Year to you, Princess Ribbon. Same to you hot yannie mama! so nice to go shopping with your family on new year day. I had to work as the boss refused to close shop. 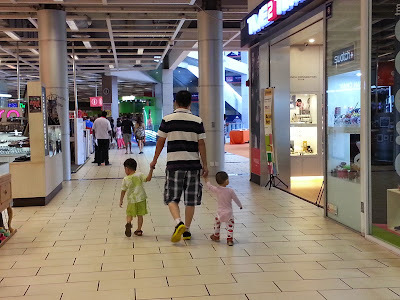 We just went out for less than 2 hours coz the kids get restless pretty fast.. Happy New Year to you and your family, Princess Ribbon. So nice of you to let the father bonds with the sons while you take care of the rest of the things. G wants to get down from the stroller to walk, so the father has to hold their hands and walk, while I takecare of the stroller lor.. Both boys get restless pretty fast.. Maximum 1.5-2 hours at the shopping mall only..
Best wishes for a Happy and Better New Year, Princess! Same to you too.. Happy new year to you & family..
Yeah the boys tall follow the father kot.. He sausage dog reminds me of the toy story dog, the "spring" dog that one!! !